around the world, soil is being lost through erosion 10-40 times faster than it is replenished, destroying 10 million hectares (ha) -- almost the size of Bihar -- of agricultural land every year, claims a us study. The economic impact of soil erosion is significant. Overall damage worldwide is estimated at us $400 billion a year, which is about four times the annual expenditure budget of the Indian government. The study says the us is losing soil 10 times faster while China and India are losing soil 30-40 times faster than the natural replenishment rate. Published in the journal Environment, Development and Sustainability (Vol 8, No 1, February 2006), the study pulls together statistics on soil erosion from more than 125 sources. The study says 30 per cent of the world's arable land has become unproductive due to erosion over the past 40 years. Though soil structure and land topography largely decide the extent of erosion, loss of vegetation cover and faulty agriculture practices speed up the process. Erosion losses are the highest in the agro-ecosystems of Asia, Africa and South America. These regions lose 30-40 tonnes of soil per ha annually, while in the us and Europe the loss averages 10 tonnes per ha. In India, 6.6 billion tonnes of soil is lost every year; China loses 5.5 billion tonnes and the us, 3 billion tonnes. "Erosion is a slow and insidious process," says David Pimentel of Cornell University, who was one of the authors of the study. "Yet, controlling soil erosion is really quite simple -- the soil can be protected with grasses/crop residue when the land is not being used to grow crops," he added. 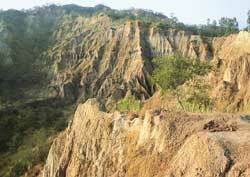 Soil erosion also affects a region's ecology. About 60 per cent of soil that is washed away ends up in rivers, streams and lakes, making waterways more prone to flooding and to contamination from fertilisers and pesticides present in the soil. Sometimes soil erosion causes loss of keystone species, which disturbs the ecosystem balance. The study revealed that agricultural land degradation alone could be expected to depress world food production by about 30 per cent over the next 25 years. On the other hand, the demand for food and other agricultural products continues to rise. According to the World Health Organization, more than 3.7 billion people all over the world are malnourished.